Sift together besan and baking powder. Make thick batter by mixing 2 tbsp of ghee (melted) and sufficient water. Melt ghee in a kadhai and drop boondis of the batter with the help of a perforated spoon. Fry boondis till light brown. Prepare sugar syrup of 3-string consistency. Add milk and then mix colour to the sugar syrup. Transfer the boondis into sugar syrup. Add raisins and chopped pistachios. 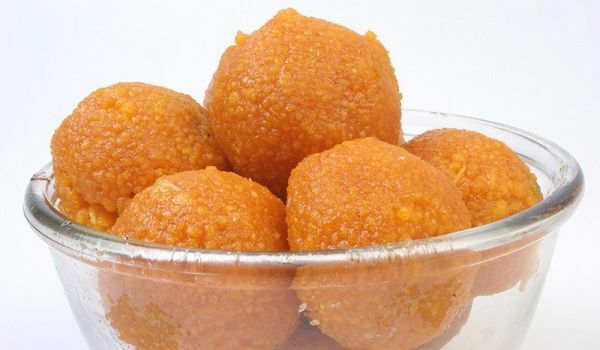 Grease your palms with ghee and make laddoos. As mentioned in the receipe 1/3 cup milk, I didn't find where have you used it?